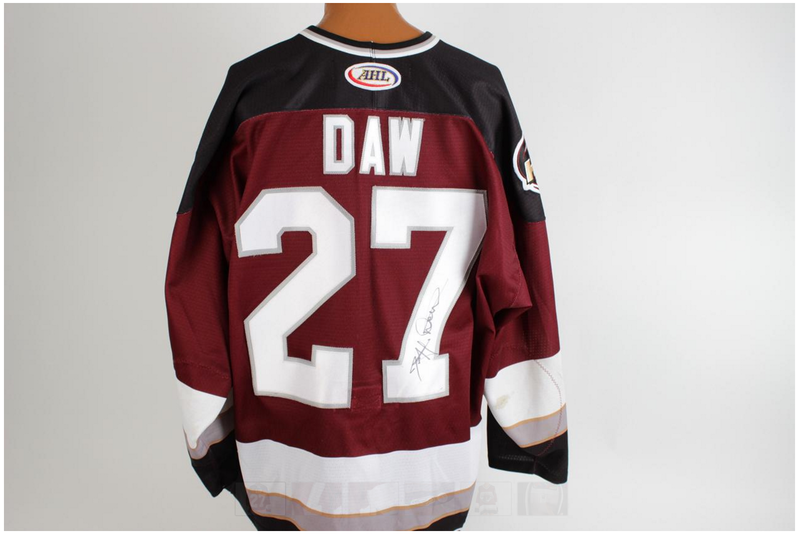 Jeff Daw played professionally from 1988 until the 2006-2007 season, mostly with minor league teams… with the exception of 1 game spent as a center for the Colorado Avalanche. He was the leading scorer of the Hershey Bears (our then affiliate team) and likely got the call up for his strong consistent play and leadership. I’d like to think that coaches in the minors and even in the NHL like to give guys like Daw a chance to touch NHL ice once even if they never really intended to keep them in the big show. It’s like hockey karma and so long as it’s not really going to hurt the team, I think they do just that. Daw was originally picked up as a free agent by the Chicago Blackhawks, then picked up in the expansion draft by the Minnesota wild before being picked-up by the Colorado Avalanche in 2001. After almost two decades of semi-pro hockey Daw came full circle as a coach for the same school he started with and achieved rookie of the year honors with as a freshman before disappearing from the online hockey databases. In the summer of 2006 James Galante – the owner of the Danbury Trashers was arrested on charges of salary fraud and Jeff Daw was subpoenaed to appear in court. He gave this comment to a reporter. I can only guess that this had something to do with him hanging up the skates a few years later. Where his is now and what he’s doing… I don’t know but he had a long career as a hockey player and was fortunate enough to have skated on NHL ice once… thanks to the Colorado Avalanche organization.